"This is just an example of doing what you can"
"We wanted to maintain the integrity of this special property"
"We needed to stop and look around and do something"
"It gives me great peace of mind to know that our land will be forever kept the way it is"
New Report by the Texas Land Trust Council Highlights Over $1 Billion in Annual Economic Benefits of Conserved Lands to Flood Mitigation, Ag, Water Resources - The new study, produced by Siglo Group in partnership with the Texas Land Trust Council, quantifies the value of lands and conservation easements that have been conserved by or with assistance from the Texas land trust community. 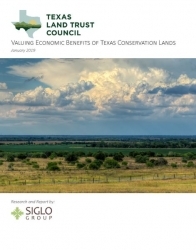 The study found that the lands put into conservation with the help of Texas land trusts are estimated to provide more than $1 billion in benefits to Texas taxpayers each year. The Guadalupe Blanco River Trust is pleased to partner with the USFWS and TPWD to support a new conservation easement in Refugio County. "We are most appreciative to GBRT for providing the opportunity to designate 73.7 acres of our land as a conservation easement and whooping crane habitat in perpetuity. We are proud to preserve and protect the Guadalupe River Basin, " Jack Darden, Jr.
GBRT is a proud recipient of the Texas Farm and Ranch Land Conservation Program. A partnership that involves the Guadalupe Blanco River Trust (GBR Trust), the U.S. Fish and Wildlife Service (USFWS) and local land owners has formed the basis of conservation planning and acquisition of vital habitats for threatened and endangered species in Texas is being supported with a recently received $316,800 Cooperative Endangered Species Conservation Fund (CESCF) grant. Since 2001, the Guadalupe-Blanco River Trust has been working to protect land in the Guadalupe River watershed. Find out how you can protect farms, ranches and wildlife habitat in the Guadalupe River watershed. Learn more about the places we have helped protect.